To celebrate the impending arrival of a sweet bundle of joy, a baby shower is a wonderful opportunity to gather loved ones for a very special celebration, and we have the perfect baby shower favors for you! Our Unique Baby Shower Honey Jar Favors are filled with our 100% natural wildflower honey, delicious beyond compare, and available in a variety of sizes and shapes to help you customize your baby shower favor selections, and create the most adorable DIY baby shower favors. 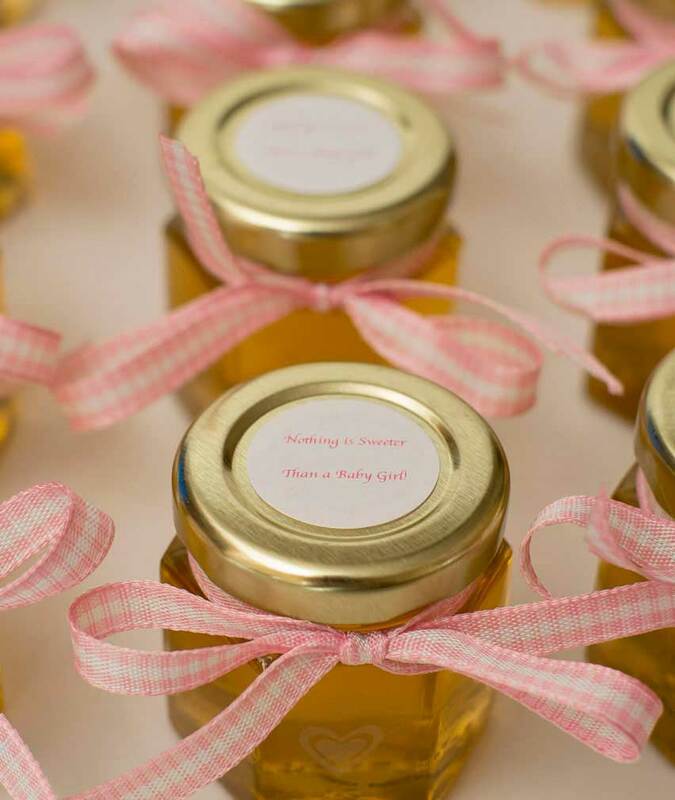 Whether your theme is Sweet as Can Bee, Winnie the Pooh or any other top baby shower theme, our Fresh, 100% natural Honey Jar Favors add the perfect touch of sweetness to your celebration, and will delight all of your guests. Take a look at some of our DIY baby shower favors for inspiration, as you plan your own DIY baby shower favors, and you’ll also find some of our favorite baby shower favor stories on our blog. Since personalizing baby shower favors is part of the pre-party fun, we make it easy and affordable to customize your favors. 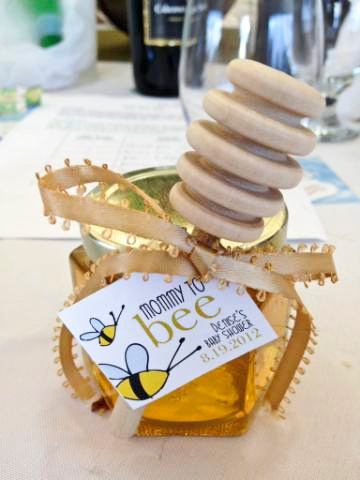 Add a DIY touch to your honey favors with our Personalized Baby Shower Labels and our Old-Fashioned Wooden Honey Dippers will complete your DIY baby shower honey favors. 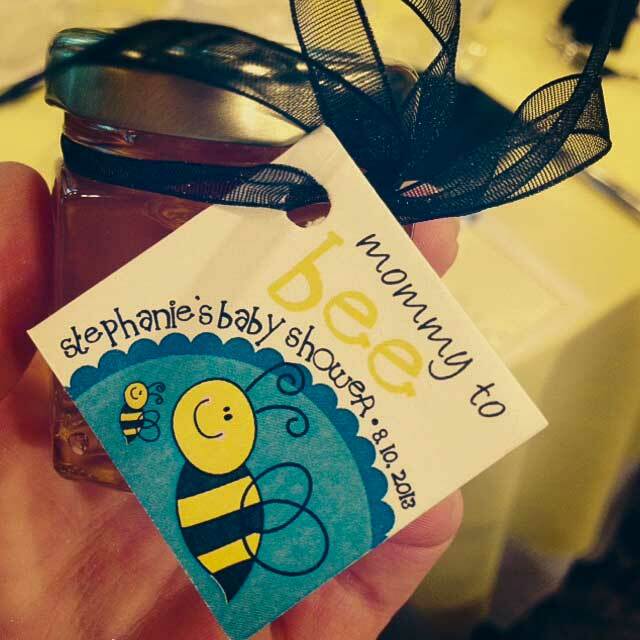 And don’t forget that our honey jar baby shower favors are the perfect addition to favor baskets, which may also be filled with our pure beeswax candles. Our goal is to make sure that your Baby Shower gets that extra special touch of sweetness. Unique baby shower favors are a perfect gift to celebrate such a joyous day. Thank your guests for attending the party with a keepsake that they can use. Below are some sample Baby Shower labels that we can add to your Honey favors. The list of sayings is endless, so if you don’t see what you want here, contact us and we’ll work with you to get the exact label that you desire. Labels are $0.30 each. 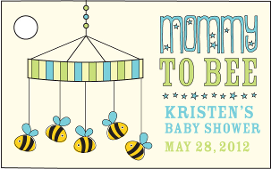 Our baby shower tags are designed and handcrafted by Lisa, a professional graphic artist who works with us. Their playful and colorful flying bees and wonderful colors make them perfect for your baby shower favors. Use our many unique styles, shapes and colors to create your special and personalized baby shower favor. 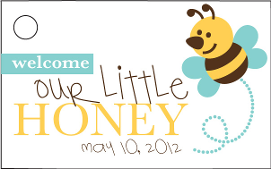 Below are sample Baby Shower tags which can be attached to our Honey Hex Favor Jars and Honey Pots.